Real Green's Lawn Club offers a brown patch reduction program for customers with annual brown patch problems. Our reduction program will minimize brown patch and limit its damage during the fall season. 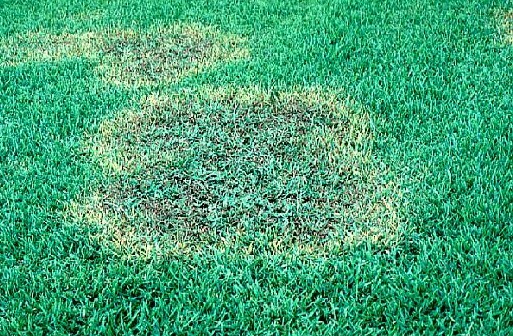 This fungus will generally occur in the same areas of the lawn each year. The spores become active in the fall as temperatures drop and there is excessive moisture available for the fungus to develop. Scarring from the damage will usually remain until new spring growth fills in the area. Our regular program will spot-treat up to 10% of your yard, should a problem occur at no additional charge. Brown Patch (fungus - Rhizoctonia solani): The name, brown patch, is not very descriptive of the varied symptom expression caused by Rhizoctonia spp. on turfgrass. Symptoms differ on cool- and warm-season grasses and vary depending on environmental conditions and cultural practices. 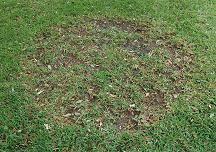 Turfgrass affected by brown patch generally will exhibit circular or irregular patches of light brown, thinned grass. On cool-season grasses (bent, rye and fescue) during periods of warm, humid weather, a darkened border or smoke ring may develop at the outer margin of the patches. The smoke-ring symptom is not reliable for diagnosis. 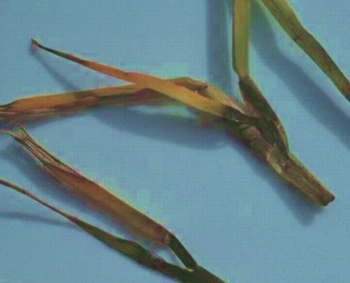 Symptoms on warm-season grasses such as bermudagrass or St. Augustinegrass include circular to irregular patches of blighted turf. Patches up to several yards in diameter commonly develop in the fall, winter and spring when these grasses are approaching or emerging from dormancy, evening temperatures are below 68 oF, and rainfall usually increases. Active infections are noticeable by yellow leaves at the edges of patches. Leaf sheaths become rotted, and a gentle tug on the leaf blade easily separates the leaf from the runner. Brown patch usually does not discolor roots. Disease develops most rapidly when air temperatures are between 75 and 85 oF and wet conditions are present and generally subsides when air temperatures rise above 90 oF. Management: Water only as needed and early in the day to remove dew and allow the grass to dry quickly. 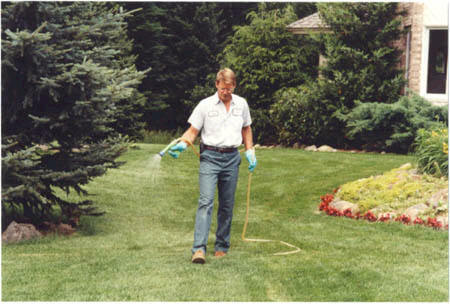 Avoid over fertilization in spring and fall. Improve the turfgrass root system with good drainage and aeration to reduce damage caused by brown patch. Fungicides are most effective when used on a preventive basis.